With the outright win at Le Mans and the IMSA GTO Championship winning run in North America, 1991 was certainly the most successful season of racing for Mazda to date. 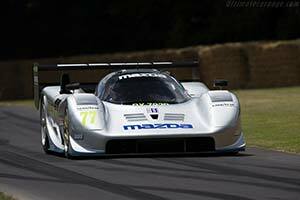 Inspired by these great results Mazda North America decided to move up the IMSA ranks by entering the Grand Touring Prototype (GTP) class in 1992. Here the Mazda team could go head-to-head with arch-rivals Toyota and Nissan. For the ambitious program a brand-new racing car was developed in-house around the four-rotor engine that had brought so much success in 1991. Headed by Lee Dykstra, of Jaguar Group 44 fame, the Mazda NA design team had already started their work in April 1990. Primarily responsible for the development of the exterior design was Randy Wittine. He received instructions to incorporate as many style elements of the upcoming, third-generation RX-7 road car as possible. Wittine managed to include some small cues of the RX-7 but mostly the very smooth shape was dictated by function rather than form. The most striking features of the design are the scalloped panels behind the front wheels through which the air from the front diffuser exited. As with all GTP cars, most of the downforce was created by elements not visible to the eye. The full width front diffuser was one but even more important were the large ground-effects tunnels that ran on both sides of the cockpit and engine. Dykstra focused on the design of the chassis and suspension. He penned a relatively straightforward carbon-fibre and aluminium honeycomb monocoque that was manufactured by Crawford Composites. It supported the front suspension that consisted of double wishbones and push-rod actuated springs and dampers that were mounted horizontally on top of the tub. At the rear much effort was made to keep as many suspension elements out of the ground-effects tunnels. Dykstra had no choice with the lower wishbones and driveshafts but did manage to mount everything else above the tunnel. This required a very unusual, horizontal, placement of the spring/damper unit. Japan's main contribution to the project was the supply of the Le Mans winning four-rotor 'R26B' engine. This sophisticated rotary engine had also powered the 1991 IMSA GTO winning RX-7. Equipped with four variable intake trumpets, it produced at least 620 bhp. This power was transferred to the rear wheels through a March five-speed gearbox instead of the Hewland that had been used in the Group C cars. The very compact engine could not be mounted as a stressed part of the chassis. Initially Dykstra had intended to use carbon-fibre extensions to support the engine, gearbox and rear suspension but he eventually settled for a more conventional steel subframe.